At Ark Industries, we offer polo tees from well-known brands, Under Armour Singapore and adidas Singapore. There are polo tees for both Men and Women. The polo tee designs are of a smart and classic design, well-liked by many. One range of adidas polos tees that we carry and is popular amongst females is the adidas CF Polo. This range of short sleeve adidas CF polos is exclusively available at Ark Industries. It comes in 4 colors – White, Black, Red and Navy. It features a long and slim placket, with 4 buttons that have a contrast colour stitching. It has a self-fabric collar that has 2 buttoned-down ends. It is made of polyester Climalite® fabric which keeps the wearer dry by wicking away all sweat or moisture. The fitting is designed to be more suitable for Asian women – thus, the cutting, sleeve and body lengths suits an average Asian female body shape well. The sizes available for the adidas CF polo for females are from S to 2XL. The adidas brand mark is embroidered on the left sleeve of the adidas CF polo tee. You are able to print or embroider your logos or texts on the rest of the positions of the adidas CF polo tee. Some of our customers choose to embroider their company logo on the left chest and print their event’s name on the back. To further personalise the adidas CF polo tee, customers can choose to embroider or print individual names on the sleeves! Look sleek and smart with the adidas CF polo. Another range of adidas Singapore polo tees is the adidas Ultimate365 Short Sleeve Polo Shirt for females. However, we do not carry this range of polo shirts at Ark Industries. They are available at adidas retail and online stores. 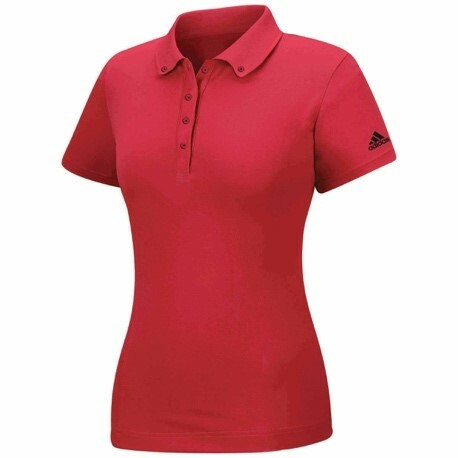 The adidas Ultimate365 Short Sleeve Polo Shirt for females is designed to be worn for golf games. It is made of 93% Polyester and 7% Elastane, which provides a 4 way stretch that provides great mobility during golf games or any other activity. Another feature is the UPF 50+ UV protection, which is useful for outdoor activities that require long exposure to sunlight. This adidas Ultimate365 Short Sleeve Polo Shirt features a regular fit, which is wide at the body (more of a straight cut). Besides the functions of the adidas Ultimate365 Short Sleeve Polo Shirt, the aesthetic of the polo is subtle and appealing. The fabric used for the yoke on the upper back features a slightly heather pattern. Similarly, the trim of the outer placket and collar feature the same heather pattern. For this range of polo tees, the colours available are White, Black, Aqua, Pink and Purple. The 3rd range of adidas Singapore polo tees for females that is popular, is the adidas Rangewear Polo. We do not carry this range in our stocks, they are available at adidas Singapore retail and online stores. 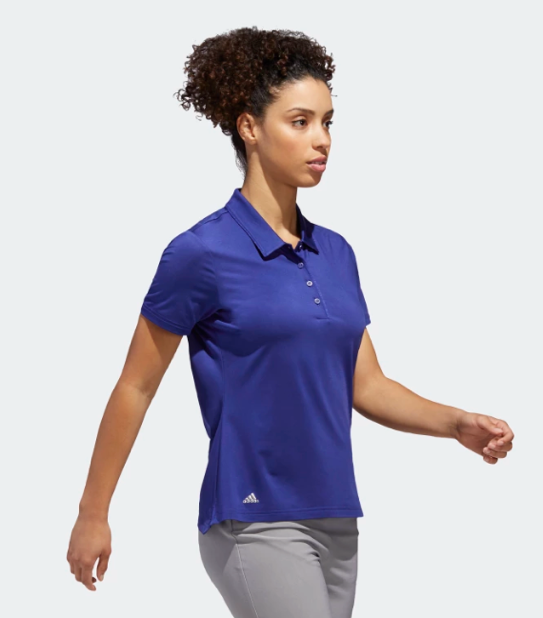 The adidas adidas Rangewear Polo’s main difference from the above 2 ranges of polo tees is the placket – the adidas Rangewear Polo for females, has an open V neck. It is made of the following material composition: 47% polyester, 30% viscose, 14% aramid and 9% elastane single jersey. The colours available are White, Pink and Lilac.